Stovepiping can lead to technical debt. Actual stovepipes — the tubes that vent exhaust from stoves — serve as a metaphor for the flow of information in “stovepipe” organizations. In “stovepipe” organizations, information flows predominantly (or only) up or down along the parallel chains of command, and rarely (or never) from a point in one chain of command across to some other chain of command [Waters 2010]. The stovepipe metaphor is imperfect, in the sense that in actual stovepipes, smoke and fumes rarely flow downwards. By contrast, in organizations, some information does flow down the chains of command. But the metaphor does clarify the problem that whatever the organization learns in one metaphorical stovepipe isn’t easily transferred to other metaphorical stovepipes. 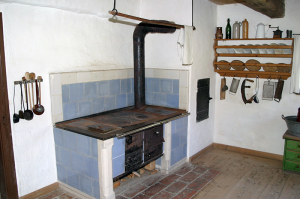 A wood-burning stove in a farm museum in Lower Bavaria (German: Niederbayern), which is one of the seven administrative regions of Bavaria, Germany. The stovepipe, which is the black tube running upwards from the stove, channels smoke and fumes out of the kitchen into the chimney, and then, presumably, out of the farmhouse. Stovepiping can occur in both organizational structures and in engineered systems. These two forms of stovepiping are intimately related, and both can lead to uncontrolled formation of new technical debt, or increased persistence of existing technical debt. In organizational structures, stovepiping occurs when similar capabilities are implemented in elements of two or more different organizational units that act relatively independently of each other. An example is the dispersal of some elements of the IT function out into IT’s customers. When independent organizations have similar technical needs, they’re at risk of independently implementing technological capabilities that duplicate each other, at least in some respects. In engineering, stovepiping occurs, for example, when two or more technological assets are managed and maintained independently [McGovern 2003]. In that situation, distinct engineering efforts working on those assets might happen to solve the same problem, possibly in two different ways, with each party either ignorant, or possibly disparaging, of the other’s efforts. In whichever way duplication of technological capability comes about, it can lead to increasing levels of technical debt, or to increased persistence of technical debt. 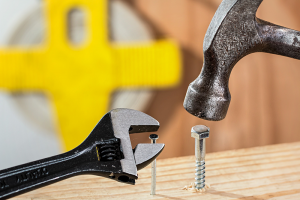 This happens because the organization might be required to execute future maintenance or enhancement multiple times — once for each instance of the technical artifact. That exposes the organization to additional cost, additional load on its staff, and additional risk of creating defects and incurring liability, compared to a situation in which technical assets are shared among all who need them. The problem is actually even more worrisome. First, in the case of a defect found in one version of a technological artifact, it’s possible that the people who are aware of the defect might not realize that another version of the artifact exists. If that other version also has an analogous defect, its defect might go unrecognized for some time, with all the usual attendant negative consequences. Second, in the case of a necessary extension of the artifact’s capabilities, the maintainers of one version might recognize the need for an extension, and implement it. Meanwhile the maintainers of other versions might not recognize the need for extension. They might not take action until something bad happens or a possibly urgent need arises. It’s easy to conjure other unfavorable — and costly — scenarios. In engineering more generally, stovepiping can occur internally in systems, even though only one business unit is involved, and even though the stovepiped artifacts serve purposes invisible to the world outside the system. This can occur whenever communication is weak between the teams designing or maintaining the portions of the system that host the similar artifacts. For those familiar with the Apollo XIII incident, the incompatibility of the two carbon dioxide scrubbers in the command module and the lunar excursion module serves as an example of the risks of technical stovepiping. When distinct business units or functions operate their own engineering or IT functions, or when they depend on a shared engineering function but require similar work, there is an elevated probability of duplication of technological assets or capabilities. This happens when the organizational structure, or the timing of the work, encourages separation of the engineering efforts. Engineering or IT functions operated separately under the control of distinct business units or functions can clearly produce duplicated capabilities. However, duplication can also occur when the engineering function is shared across distinct business units or functions, but the actual people and teams performing the work differ for different efforts, and when communication is weak between those teams. This can happen whether or not the efforts are conducted contemporaneously. Because identifying these forms of technical debt after they’re created is notoriously difficult, preventing their formation is preferable to trying to detect them post-implementation. Prevention is possible if the enterprise establishes mechanisms that facilitate consultation and sharing among elements of different, separately operated technology development or maintenance functions. In other words, the organization must “break” the stovepipes — no mean feat, politically speaking. Another challenge, of course, is providing resources for such sharing mechanisms, because preventing technical debt is rarely recognized as a value generator. If it were so recognized, the resources would likely appear. Changes in cost accounting might make such recognition more likely. [McGovern 2003] James McGovern, Scott W. Ambler, Michael E. Stevens, James Linn, Vikas Sharan, and Elias K. Jo. A Practical Guide to Enterprise Architecture , Upper Saddle River, New Jersey: Prentice Hall PTR, 2003. [Waters 2010] Donald Waters. Global Logistics: New Directions In Supply Chain Management, 6th Edition , London: Kogan Page Limited, 2010. Ward Cunningham, who coined the technical debt metaphor. Photo (cc) Carrigg Photography. Ward Cunningham coined the technical debt metaphor in the context of developing a software asset [Cunningham 1992] [Cunningham 2011]. He observed that when the development process leads to new learning, re-executing the development project—or parts of the project—could lead to better results. For this reason, among others, newly developed software assets can contain, embody, or depend upon artifacts that, in hindsight, the developers recognize could be removed altogether, or could be replaced by more elegant, effective, or appropriate forms that can enhance maintainability, defensibility, and extensibility. To deploy the asset in pre-hindsight condition would entail an obligation to return to it in the future to implement the improvements revealed by that hindsight. That obligation is Cunningham’s conception of the asset’s technical debt. This phenomenon is not restricted to newly developed software. It applies to all technological assets. And it applies to new development, maintenance, cyberdefense, and enhancement. Cunningham was aware that he was using a metaphor to describe his situation, which is a common one in technological development projects—both software and hardware. He probably chose the debt metaphor because his audience was financially sophisticated. 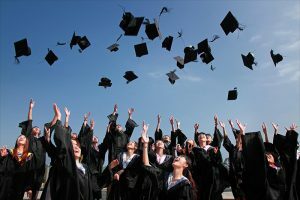 He was exploiting their knowledge of financial instruments to convey a concept that, from his perspective, properly belongs in the software engineering body of knowledge. Such uses of metaphors are not unusual. And they are also dangerous. The danger arises when we rely on the audience to apply their experience to interpret the metaphor in the way we intend. But since the experience of every individual is different, we cannot be certain how the audience might interpret the metaphor. And that is where the trouble begins. Before we undertake our exploration of the technical debt metaphor, we must investigate the structure of metaphors. This study will help us understand how the technical debt metaphor has evolved and how it continues to evolve. Even more important, a study of metaphors will help us understand and anticipate the communication problems that arise from the fact that the term technical debt is a metaphor. We’ll look at the structure of metaphors next time. [Cunningham 2011] Ward Cunningham. “Ward Explains Debt Metaphor” (video; here; ). Because metaphors compel our minds to accept the identification between source and target in toto, they can cause us to make errors of thought. Those errors create risks for the enterprise as we attempt to manage technical debt. The risk arises because we begin to regard technical debt as a form of financial debt, when in reality it is not. A metaphor is a figure of speech that references one concept, object, or action, by identifying it with another, when that identification is not literally accurate. Metaphors help us understand and experience one thing, with which we might be unfamiliar, in terms of another, with which we are more familiar [Lakoff 1980]. 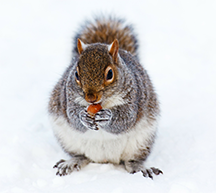 In these examples, Oscar Wilde is not saying that friends actually stab anyone; “Carrie Bradshaw” is not saying that squirrels are rats, or that they wear clothing; and Frost or Twain are not saying that banks actually lend umbrellas. Nevertheless these three statements do literally imply stabbings, squirrel clothing, and umbrella distribution. These metaphors make their points by being literally inaccurate. The literal but untrue assertion is the hallmark of the metaphor. The fundamental structure of metaphors is “A is B.” Borrowing terminology from cognitive linguistics, A, the main entity referenced, is called the target of the metaphor; B, the entity alluded to, is called the source. Thus, the squirrel is the target; the rat in a cuter outfit is the source. The bank is the target; the perfidious umbrella lender is the source. For the technical debt metaphor, the needed technical work is the target; financial obligation or financial debt is the source. 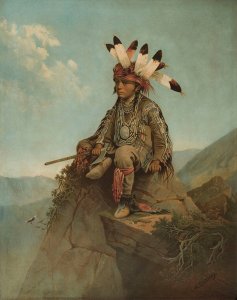 Metaphors serve to aid us in applying what we understand well in the domain of the source, to what we understand less well in the domain of the target. Definition A metaphor is a figure of speech used to convey understanding of one concept, object, or action by identifying it with another that is well understood, even though the identification is not literally accurate. The well-understood concept is called the source. The less-well-understood concept is called the target. The metaphor is thus a statement that “<Target> is <Source>.” Although the identification of target with source is literally invalid, it provides a means of understanding some aspects of the target in terms of some of the properties or behavior of the source. Because metaphors compel our minds to accept the identification between source and target in toto, they can cause us to make errors of thought. Those errors create risks for the enterprise as we attempt to manage technical debt. The risk arises because we begin to regard technical debt as a form of financial debt, when in reality it is not. This misidentification is an acceptable risk, if it is properly managed and understood, but that risk is often unrecognized, and therefore it remains unmitigated. A significant source of this risk is our inability to control which attributes of the metaphor’s source the reader or listener chooses to associate with the metaphor’s target. We can call this phenomenon unintended association. 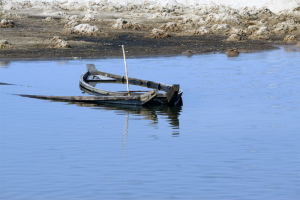 Some of the unintended associations of the technical debt metaphor cause real problems for organizations as they try to manage their technical debt. We explore the unintended associations of the technical debt metaphor next time. 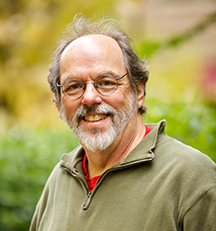 Ward Cunningham, who coined the technical debt metaphor in the context of developing a software asset [Cunningham 1992] [Cunningham 2011], observed that when the development process leads to new learning, re-executing the development project — or parts of the project — could lead to a better result. For this reason, among others, newly developed operational software assets can contain, embody, or depend upon artifacts that, in hindsight, the developers recognize could be removed altogether, or could be replaced by more elegant, effective, or appropriate forms that can enhance maintainability, defensibility, and extensibility. To deploy the asset in pre-hindsight condition would entail an obligation to return to it in the future to implement the improvements revealed by that hindsight. That obligation is Cunningham’s conception of the asset’s technical debt. 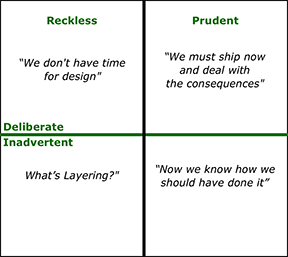 Fowler’s technical debt quadrant. Intentionality is the vertical axis; Wisdom is horizontal. In the decades since Cunningham coined the term, the meaning of technical debt has evolved to include much more than Cunningham’s original concept. Martin Fowler developed a 2×2 matrix (Intentionality x Wisdom) that describes four different pathways that lead to technical debt creation. Cunningham’s concept corresponds to what Martin Fowler describes as, “now we know how we should have done it” [Fowler 2009]. In software-intensive systems, technical debt is a collection of design or implementation constructs that are expedient in the short term, but set up a technical context that can make future changes more costly or impossible. Technical debt presents an actual or contingent liability whose impact is limited to internal system qualities, primarily maintainability and evolvability.